Animal organs. Nervous system. Subpallium. Atlas of plant and animal histology. 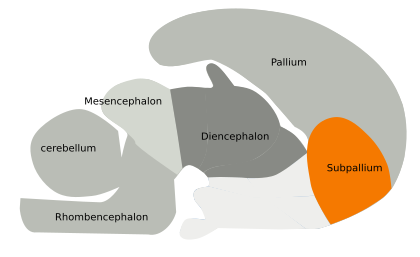 Subpallium is found ventrally to the pallium, and both form the telencephalon. Unlike the pallium, which is formed mainly by neurons arranged in layers, subpallium contain neurons organized in nuclei or groups. 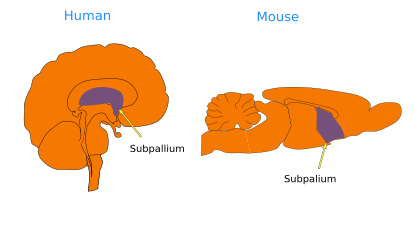 Subpallium encompasses the striatum, globus pallidus, area innominata, preoptic region and ventral septum, as well as some parts of the amygdala. Striatum is divided in accumbens, caudate and putamen nuclei. It is the largest structure of the subpallium and it is involved in the control of motor abilities and voluntary movements, as well as other functions. This is clear in the Parkinson disease when striatum losses the dopaminergic afferents, which results in malfunctions and failures of motor behaviour and normal cognitive activity. Globus pallidus and the striatum form the so-called basal ganglia, and both participates in the control of movement activity. Basal ganglia, together with the dopaminergic afferents coming from the mesencephalic substantia nigra, are also involved in addiction and reward mechanisms. Subpallium in a non-fully developed encephalon. Several structures are found in the substantia innominata such as the basal nucleus of Meynert, diagonal band of Broca and interstitial horizontal nucleus. These nuclei, together with the septum, provide most of the cholinergic innervation of the cortical areas, releasing the acetylcholine neurotransmitter.